With the exception of Borba, all the Orum gang members are unusually rude, even for Orcs. Magub is no exception and will introduce himself like this: "Yeah? I don't care who you are. I ain't talking to you. You ain't from around here. So push off." Should you first meet him in Borba's Goods and Stores then he will introduce himself like this: "Me? I'm Magub gro-Orum. Borba and me, we were pals in the adventuring trade. Now I help him run the store." He will, however, add two markers to your map when you ask him about Cheydinhal: "Treasure holes near Cheydinhal? Not close by. Fort Naso and Fort Facian, though... bad news. Undead, and then some. But far out and foul enough, you'll get plenty of action." On subsequent meetings, he will reject you with the words: "I'm done talking to you. You ain't listening. I got better things to do." 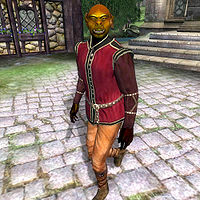 This issue has been addressed by version 2.0.0 of the Unofficial Oblivion Patch; The house has been renamed to "Magub gro-Orum's House".